Need Help with Pest ID? School has begun – or will begin very soon – in many school districts. Now is the time to get a handle on red imported fire ants on school grounds. Managing fire ants in and around schools requires balancing the health risk of someone being stung by fire ants with the risk of pesticide exposure. One of the safer methods of managing fire ants is through the application of baits. For optimal results, baits should be applied between 70 and 85 degrees F when fire ants are most active. During the summer, this typically means applying bait early morning or early evening. Make sure the bait is acceptable to the ants. Apply baits when no rain or dew is expected for at least five hours; if the bait become soggy, it will no longer be attractive to the ants. Avoid disturbing the ants or the mound right before applying the bait. Apply bait along the edges of mounds, rather than directly on top. Take some time to walk around school buildings and grounds near buildings to locate any fire ant nests. Pay close attention to areas students may congregate, line up for buses, around outdoor trashcans, play areas, and athletic fields (Figures 1 and 2). If you find there are multiple fire ants nests on the school grounds, a broadcast bait application can be very efficient. With broadcasted baits, a small amount goes a long way. And broadcasting small amounts of bait over larger areas poses minimal health and environmental risks. However, if only a few nests are present, is may be more efficient to bait each mound individually. Remember, baiting does require some time before results are seen – anywhere from a few days to a couple of weeks – depending on the active ingredient. Baits containing insect growth regulators usually take longer to work. With that in mind, if any fire ant mounds are located in areas where they may pose an immediate threat, a nest drench with a liquid insecticide or a watered-in granular insecticide may be appropriate. As with baiting, the best time to treat mounds individually with a liquid or granular insecticide is early morning or early evening as most of the brood and the queen will be closer to the surface at that time. Ant season is upon us, and it’s likely you are up to your ears in complaints from teachers and staff seeking some relief from ant invasion. Know your enemy. The first order of business for successful ant management is knowing what ant species you’re dealing with. If you are having trouble identifying the species present, refer to this fact sheet: https://content.ces.ncsu.edu/a-guide-to-house-invading-ants-and-their-control. You may also submit insect specimens to NCSU’s Plant Disease and Insect Clinic (https://projects.ncsu.edu/cals/plantpath/extension/clinic/). There is a $30 fee to submit a sample. Control. Ants invade homes and other structures in search of food, water, and shelter. Therefore, effective ant management needs to be a combination of control methods that involve inspection, sanitation and exclusion, habitat modification, and often some type of insecticide. Figure 1. Place nontoxic food bait inside to establish ant trails (Photo: Patty Alder, NCSU). Inspection. It is important to check carefully and thoroughly both indoors and outside to determine areas of ant activity, nest locations, and type of ant present. Indoors, follow ant trails to locate their entry point(s). You may consider placing a nontoxic food bait in these areas to establish a trail that you can follow (Figure 1.) Although this will take extra time, it may pay off in those situations where your control efforts have not been effective so far. Outside, check the foundation, walkways, trees and shrubs, and in mulched areas for ant trails. Look for nests in mulch and vegetation next to the foundation. Check under patio blocks, stepping stones, and in piles of rocks, lumber, and other debris. Inspect the foundation to find possible ant entryways such as areas where pipes enter the building, foundation cracks, and around doors and windows. Sanitation and Exclusion. Removing or reducing indoor sources of food and water can help reduce ant activity indoors. Susceptible food items should be stored in pest-proof containers or stored in the refrigerator. If possible, any class pet food should not be left out continuously. Wiping down indoor surfaces, such as floors and countertops, with soapy water is helpful in a couple of ways. First, the soap removes food residue that may be attracting the ants. Secondly, it disrupts the ant pheromone trails that are leading more ants indoors. Don’t forget to check for leaks or plumbing issues that could be drawing ants indoors. Exclude ants from entering the structure by sealing up any gaps, cracks, or holes around windows, doors, and foundations. Habitat Modification.Habitat modification involves landscaping and other activities that can reduce the likelihood of ants nesting in areas around buildings. For example, mulch often provides an excellent nesting habitat for many ants. It provides shelter, warmth, moisture and it can prevent pesticide sprays from reaching their intended target. Mulch, leaf litter, and vegetation should be kept 10-12 inches away from the foundation. Piles of lumber, bricks, stones, or other debris should be stored away from buildings as well. Figure 2. Vegetation touching the structure can provide a bridge over treated areas (Photo: Patty Alder, NCSU). Many ants are attracted to the sweet plant secretions and fruits/berries of ornamental trees and shrubs. Ants also feed on “honeydew” – a sugary material secreted by aphids and other insects often found on ornamentals. Trim back any tree branches or shrubs that are touching the house so that ants cannot use them to get around pesticide treated areas and enter the building (Figure 2). Controlling honeydew-producing insects on ornamental trees and shrubs will help reduce ant food sources. Insecticidal Control. Simply spraying foraging ants may bring temporary relief but most often it fails to provide long-term, effective control. The most effective ant control is accomplished by locating and destroying the nest(s). Sometimes the nest can be found by following the foraging workers back to the nest site. Once the nest is found you can spray or drench it with a spray or granular insecticide. Or you may treat the nest using a bait; just remember baits are slower acting. While finding and destroying the nest is the most effective control strategy for ants, finding the nest is not always possible. Many pest ants we deal with do not make large, discreet nests (e.g., Argentine and odorous house ants). And these ants often have multiple nests spread out over the landscape. Therefore, finding and treating each nest may not be possible. In those cases, you can apply an insecticide outdoors to help reduce ant populations and possibly keep ants from invading the home. Spray any known or suspected ant entryways: gaps around doors and window frames, cracks in bricks and foundations, around crawl space doors, foundation vents and utility openings, and under siding. In addition, you may apply a protective barrier or perimeter around the building. Figure 3. Limit indoor spraying to crack-and-crevice and void treatments where possible (Photo: Patty Alder, NCSU). You may also need to spray indoors for ants. If that is the case, stick with crack-and-crevice applications and spot treatments, wherever possible (Figure 3). Try to limit your indoor spraying to known or suspect areas ants are using to access the building. When choosing an insecticide, you have the option to apply a repellent or non-repellent product. Understanding the difference between repellent and non-repellent insecticides will help you determine which formulation is best suited for the situation. Fast acting pyrethroid insecticides, like Demand® CS, are considered repellent products because they create a barrier and act quickly to prevent ants from maintaining a pheromone trail. The resulting distraction from their trail gives the appearance that they have been repelled, even if a product formulation limits repellency. Slower acting insecticides, like Termidor®, are considered non-repellent products and take longer to knock down an insect. Insects cross over surfaces treated with these insecticides and return to the nest before they are affected, thus maintaining a trail and encouraging more ants to come in contact with the same treatment. In addition, foragers that have contacted the chemical may “transfer” some of the chemical to other colony members through grooming and feeding activities. Both formulations have pros and cons. Fast-acting repellent insecticides are excellent for creating chemical barriers around structures, but a thorough application is crucial. The chemical must penetrate heavy vegetation, ground cover or mulch and reach the ground so that foraging ants come in contact with the treatment. In such cases, the use of a granular insecticide like Demand® G may help move the active ingredient through the vegetation or mulch where it can create a complete barrier to insect movement. Just remember that granular formulations need to be watered in. The slower action of non-repellent insecticides is great because it does allow foragers to get some of the chemical back to the nest where other ants can be exposed to it. On the other hand, because ants will move more readily through the insecticide, teachers and staff may likely continue to see ants indoors (at least for some time). Whether you use a repellent or non-repellent insecticide will depend on each unique situation. What ant species is/are present? How tolerant are those involved? How bad is the infestation? Etc., etc. In addition, communicating with and educating teachers/staff on your decision will be key, regardless of what product you choose. The other obvious treatment option for ants is baiting. Bait may be applied indoors and outdoors. When baiting indoors, you should expect to see ants at or near the bait. Again, this is where communication and education are key. If you are dealing with someone that has low tolerance, try to place the bait in out-of-sight areas. Or, you may choose to bait outdoors only. Before you spend a lot of time (and money) on a complete bait application, make sure the ants accept the bait. Once you find an acceptable bait, place it at or near areas you are seeing ant activity. And be sure baits are placed away from areas you have applied a spray or granular insecticide. Figure 4. Outdoor bait stations are an excellent choice for high populations of ant species that prefer liquid, sugary foods (Photo: www.spmglobal.com). For ant species that tend to present in high numbers, such as Argentine and odorous house ants, you may consider placing a liquid, sugar-based bait outdoors in plastic bait stations (Figure 4). Be sure to place bait stations out of the reach of children. Many times baits are not effective simply because a sufficient amount is not put out to account for the large infestation. Carpenter ants and red imported fire ants seem to accept granular baits quite well. But again, because food preferences can change for ants, depending on the season and other food availability, it’s always a good idea to make sure the ants are accepting what you are offering before you apply it everywhere. In summary, treating for ants will be most successful when you first determine what ant species is present. Good sanitation, exclusion, and habitat alteration practices are necessary as well. And finally, choosing the correct chemistry and insecticide formulation(s) is key – and that will be decided by each unique situation. Termite damage to wooden cabinets attached to an exterior wall. Termites used the expansion joint to reach the wood. We are at the time of year where termite swarms will start showing up outdoors and possibly indoors. Swarms outdoors are likely to occur not far from trees and stumps where the termite colony is feeding on dead roots and in the stumps. For the most part, these swarms can be ignored but they’re a reminder to keep up with building maintenance issues that may create conditions suitable for termites. If termites swarm indoors, they can be simply vacuumed up and discarded outdoors. There is no need to spray them with a pesticide (and swarming termites are not an emergency and will not change the fact that you have a termite infestation. It’s a good idea to check inside along walls (particularly along expansion joints for signs or termite tubes that may indicate an actual problem. Inspections can be complicated because of floor and wall coverings including built-in cabinets which may hide termite activity. Drilling slabs to inject insecticide into the soil beneath the building adjacent to the expansion joint. Treatments can be expensive because it may require drilling a slab in order to treat termites that are coming up through an expansion joint. Treating the building exterior may help, but it does not guarantee that you’re controlling the problem. Another option (although potentially more expensive) is the the use of a termite baiting system installed along the building’s exterior and possibly using “aboveground stations” inside to attack the termite colony more quickly. Regardless with both of these choices, termites are not going to cause significant damage in a few weeks (or a month or more). So, treatment can easily be delayed to weekend or even until a school holidays for when the school is closed (or at this point, even the end of the school year would not be unreasonable) . We have some relevant information mostly targeting residential settings but does provide valuable information about termites in general. 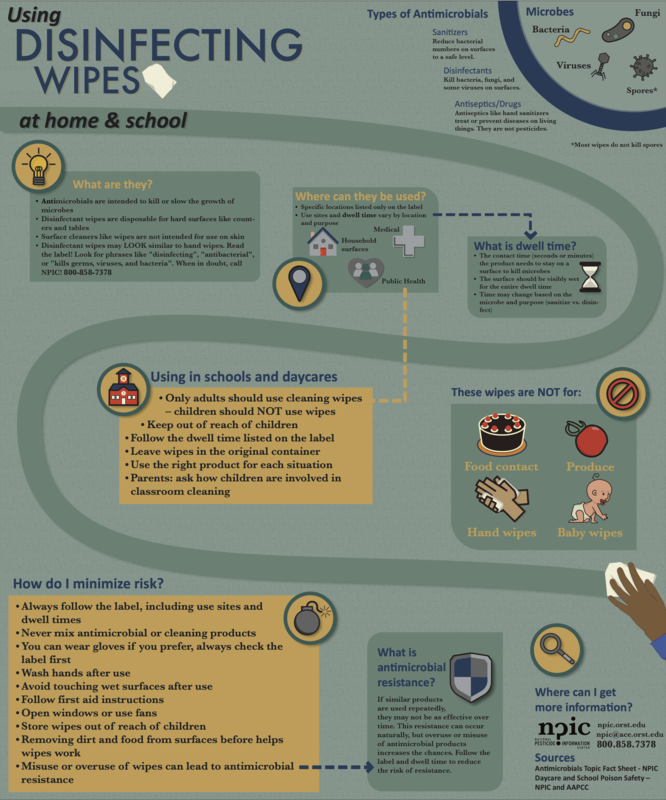 The National Pesticide Information Center has released a new poster about using disinfectant wipes in schools. They can be very valuable when used properly, but should never be used by children. If you look at the containers, they say “Keep Out of Reach of Children”. That’s not a suggestion. IT’S THE LAW!! Winter months are rodents’ most active time for entering structures as they search for food and shelter from cold temperatures. Now is the time to begin taking steps to rodent-proof structures, both inside and out. Keep them out! Remember, mice can squeeze through an opening the size of a dime or larger, while rats can get through openings quarter-sized or larger. Locate and seal up any gaps on the building exterior. Depending on the size of the opening, screen, sheet metal, steel wool, or copper scrub pads may be used to seal openings. Caulk may be used in some cases, but may not be as long lasting. Make sure all doors and windows tight fitting with weather stripping. Exterior doors should have door sweeps installed. Figure 1. Debris and other clutter around buildings can harborage rodents (Image: Mike Waldvogel, NCSU). Don’t give them a place to hide! Reduce or eliminate unnecessary clutter, both indoors and outside. Keep potential shelters such as piles of wood, bricks or stones away from the foundation of buildings to discourage rodents from setting up camp right outside (See Figure 1). Rooms or closets with lots of clutter can also provide hiding places for rodents. A little organization goes a long way in eliminating those potential homes for rats and mice. Figure 2. Mouse damage to a bag of grass seed (Image: Mike Waldvogel, NCSU). Don’t feed them! Store susceptible food items in sealed, pest proof containers. This includes the foods we eat – like cereal, grains, and rice – as well as pet food, birdseed, and even grass seed (see Figure 2). Do some landscaping! Rodents can gain access to buildings by climbing across tree limbs and entering the attic or eaves. Trim back trees and shrubs so they are not in direct contact with the foundation so that you can easily spot and address new points of entry that develop. Taking the steps outlined above can help you make it through the winter months without unwanted guests! Figure 1. Multi-colored Asian ladybird beetles. (Photo: Bruce Watt, University of Maine, Bugwood.org). Adult multi-colored Asian ladybird beetles are convex in shape and about 1/4” long. Specimens from higher elevations are larger than those from the Piedmont and Coastal Plains. There are usually ten black spots on each forewing, but some have fewer spots or faded spots and some have no spots at all (see Figure 1). Adult beetles begin laying eggs on host plants in early spring. Eggs hatch in three to five days. Larvae are orange & black in color. Larvae molt four times, becoming larger after each molt, and enter an immobile pupal stage after the last molt. After several days, the adult beetle emerges from the pupal case. Multicolored Asian lady beetles are effective predators of aphids and some scale insects and are extremely beneficial for both agricultural and horticultural crops. As temperatures start to drop in the fall, adult beetles begin to search for suitable overwintering sites. They tend to congregate on the sunnier or warmer sides of buildings, or on exposed, light-colored buildings. Of course, this doesn’t mean that people with dark-colored siding, brick or log homes are immune to the lady beetle assault. On warm winter days, the beetles may become active and move towards light or bright surfaces. They are often found on windows, light fixtures and ceilings. Multi-colored Asian ladybird beetles do not reproduce indoors; in the spring, they will move outdoors in search of prey. Ladybird beetles are primarily a nuisance. They do not eat wood or furniture. However, the beetles may stain fabric and painted surfaces if squashed. In addition, there have been concerns that large numbers of beetles may possibly cause air quality problems indoors that could trigger allergies and/or asthmatic reactions. While it is not 100% effective, preventing the beetles from entering structures is one of the best long-term approaches for dealing with ladybird beetles. Install tight-fitting sweeps on exterior doors and weather stripping around door frames. Openings where utility pipes and wires enter the foundation and siding should be sealed. Make sure that window screens are in good condition. Indoor sprays tend to be ineffective against ladybird beetles. Invading beetles should simply be vacuumed up. The vacuum bag should be sealed up and disposed of. Outdoors, a residual spray insecticide may be applied around windows, doors, eaves, soffits, attic vents, etc. Its first detection in North Carolina was in Forsyth County in 2009, and it has since spread rapidly throughout the piedmont and mountain regions of the state. The coastal plain has had fewer occurrences during this period, although the insect has appeared in isolated locations. As of June 2016, it had been confirmed in 70 of NC’s 100 counties. Adult brown marmorated stink bugs are slightly larger than 1/2” and vary in color from brown to gray. Adults have characteristic brown and white bands on the outer edge of the thorax, and white and brown banding on the next to last antennal segment (see Figure 2). Adult females lay egg masses in midsummer. There are five nymphal stages. New adults emerge in late summer. In the fall, adult brown marmorated stink bugs aggregate on and inside houses, sheds and other structures in search of an overwintering sites. The bugs can give off a characteristic odor if they are crushed or disturbed. Just as with ladybird beetles, exclusion goes a long way in preventing brown marmorated stink bug invasions. Make sure exterior doors have tight-fitting sweeps, seal openings where utility pipes and wires enter the foundation, and make sure window screens are in good condition. The use of pesticides indoors for controlling the brown marmorated stink bug is not warranted; invading stink bugs should be removed with a vacuum cleaner. Outdoors, a residual spray applied around windows, doors, and other potential entry points may provide some relief. Adult paper wasps are about ¾” to 1” long and reddish brown to dark brown in color with yellow stripes on the abdomen. They are actually beneficial in that they feed on other insects. Figure 3. Paper wasps build single-comb umbrella-shaped nests (Photo: Whitney Cranshaw, CSU, Bugwood.org). Paper wasps live in nests that usually contain around 250 individuals. Paper-like nests, shaped like tiny umbrellas (see Figure 3) are attached by a short stem to eaves, porch ceilings, attic rafters, decks, and other such protected places. Paper wasp colonies are annual; workers die off in the fall and only inseminated queens survive. The surviving queens are often seen hovering around chimneys and rooflines as they search for a suitable place to spend the winter. On warm winter days, the queens may become active and may move into living areas of the home through openings such as heating vents, baseboards, and gaps around light fixtures. Figure 4. Paper wasp nests should be treated with a Wasp & Hornet spray that can propel the insecticide 10-15 feet (Photo: Patty Alder, NCSU). Wasps that invade homes can be controlled mechanically, by swatting or vacuuming, or with an aerosol insecticide. Openings through which wasps can enter the structure should be caulked or sealed. In homes, attic vents should be properly vented to exclude overwintering queens. If an established nest is found in the attic, a total-release aerosol may be used on a warm day. Follow the product label instructions concerning how many cans are needed for the size area you are treating. Never exceed this number of units, and always be careful using these products near open flames. If all the workers have not yet died, and a nest poses a hazard, use a Wasp & Hornet spray that will propel the insecticide about 10-15 feet and direct the spray into the nest opening for 5-10 seconds (see Figure 4). Face flies and cluster flies. Female face flies feed primarily on the tears, saliva, mucous, blood, and excrement of pasturing animals, especially cattle. They do not actually bite their victims. Male face flies spend their time perched on vegetation, awaiting mates. Face flies are most likely to invade farm homes or homes located near pastures or where cattle are kept. Adult cluster flies are slightly larger than the house fly and dull gray in color with black markings. The thorax is covered with distinct golden-yellow hairs (see Figure 6). Cluster flies have an interesting life history in that they are parasites of earthworms. Adults lay eggs on the soil and the hatching larvae enter earthworms, develop to their last larval stage, pupate and emerge as adults. In the fall, adult cluster flies seek protected over-wintering sites within the cracks, crevices and voids of structures. Fortunately, they do not damage structures, but they may leave small dark-colored spots of excrement on windows and walls. As with other overwintering pests, exclusion is one of the best approaches to preventing cluster fly and face fly invasions. Cracks around windows, doors, siding, utility pipes, behind chimneys, and underneath the fascia and other openings should be sealed. Damaged screens on doors and windows should be repaired or replaced. Light traps may be placed in voids or drop ceilings to help reduce fly numbers. Indoor crack & crevice & void applications where flies are overwintering may be helpful. However, piles of dead flies left in the walls can sometimes lead to secondary infestations of carpet beetles. When using exterior sprays, it may be more effective to concentrate the chemical on the sunny side of the house, where the flies tend to aggregate.